In a sequence of events that would actually make for a pretty good blues song—were its central figure not so staggeringly unsympathetic—Hollywood producer Harvey Weinstein appears to have been dumped by his brother, one of his oldest friend in Hollywood, and his wife, all in the space of a couple of days. The reason for those departures, of course, being that those same days were the ones in which two different high-profile pieces of journalism arrived on newsstands, alleging that Weinstein engaged in a decades-long, much-rumored pattern of inappropriate behavior with women that included sexual harassment and assault. The last straw apparently came today, with The New Yorker’s article alleging that Weinstein has sexually assaulted at least three young actresses during his time with Miramax and The Weinstein Co. 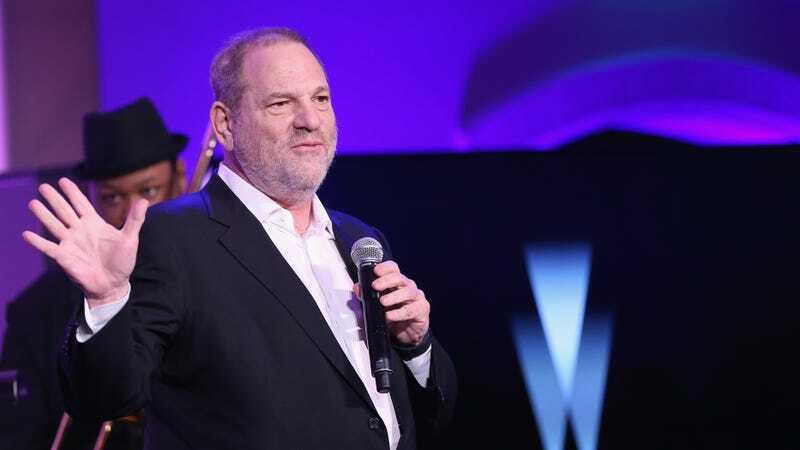 Meanwhile, there are multiple rumors and reports suggesting that Weinstein feels betrayed by his brother, Bob Weinstein, who was reportedly one of the Weinstein Co. board members who voted for Weinstein to be fired earlier this week. Harvey Weinstein retained the services of high-powered attorney Patti Glaser today, with an eye toward a potential legal battle with the company’s board. Meanwhile, CNN quoted sources last night stating that Weinstein views this whole ordeal as a potential “takedown” from his brother; whether that’s in any part true—or just a deflection on Weinstein’s part from the thought of his own alleged behavior finally catching up with him—or not, it’s clear that Bob Weinstein was willing to remove his brother from their shared brand in the wake of the reports. As of today, Harvey Weinstein’s transformation into a Hollywood pariah appears to be complete; earlier tonight, USC announced that it would be declining $5 million from him for an endowment for female filmmakers. We can only hope his fate will serve as an example of what not to (allegedly) do when you find yourself in power over others, rather than as a reinforcement of the idea of all the things you can get away with for decades provided that you’re powerful enough to keep people quiet for years.